You have worked hard to develop a great business website, and a strong social media presence. 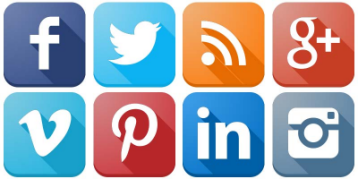 You have consistently created links back to your website on your Facebook, LinkedIn and Twitter accounts. All Set! Right? Not really, you should you also link from your website to your social channels. These links to your social profiles from your website are a simple and highly effective component of digital marketing. First is the concept of Link building. As search engines get smarter, it is increasingly difficult to stay on top of all the ways to make sure people can find your business online when they search. Since the late 1990s search engines have treated links as votes for popularity and importance in the ongoing opinion poll of the web. The engines themselves have refined the use of link data to a fine art, and use complex algorithms to perform nuanced evaluations of sites and pages based on this information. It makes sense then to get quality links pointing back to your website, but why link away from it? The simple answer is that you also need to build search relevance for your business on the different social media channels. Building quality links for your social networks helps those display more prominently in search results, which assists your overall business presence with online social media icons on your website. Second, improve your search engine results. Although it may sound backwards, adding links to your social channels from your website actually helps increase the chance that users will find your website when they search on Google, Bing, Yahoo! and other engines. Google states this directly in their support section of why and how to connect to Google+: "Linking your Google+ Page and your website is useful because it provides Google with information that we can use to help determine the relevancy of your site to a user query on Google Search." Finally it helps visibility. Just having the links on your site isn't good enough, you want to make sure that it is easy for users to find them, so they can interact with you wherever your business lives on the web. Research shows that the most effective position is at the top of your website on the home page. Make sure that the buttons or links stay with the user as they walk through yor pages. To be optimal, each link needs to open in a new tab or window so the readers don't leave your website completely. So there you have it! Being active on social media helps you build or retain a solid audience, you want to leverage that effort to make sure that both the search engines and your target consumer market can find you with the greatest of ease. It puts you in a position of making connections across the web between content that you control. It is a great way to maximize your presence and ensure you can get the largest number of eyes on your products and services.